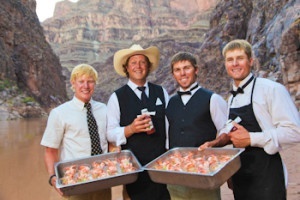 The Western River guides were AMAZING on this rafting trip on the Colorado River. The food was great and they really took care of us. It was just a phenomenal trip that I will never forget and I want to thank them for making my trip amazing. This trip was also my graduation present from my aunt, the guides knew this trip was a gift and they tried to make it the best present I could ever have. So, for all the people that were there thank you so much for all you did.